The area surrounding this community was first settled in 1645 when Dutch Governor Willem Kieft (1597-1647) purchased the parcel of land and granted use to Dutch and English families. Governor Kieft allocated the 900 acres that currently constitute College Point to the Lawrence family, but in 1788, William Lawrence began to sell his land to pay off debts. College Point takes its name from St. Paul’s College, founded here in 1838. One of the most notable later settlers in the College Point district was Reverend William A. Muhlenberg (1796-1877), who purchased all the land on the tip of the Lawrence peninsula. Reverend Muhlenberg attempted to meld the differing viewpoints of Protestantism and Catholicism within the Evangelical Church, an effort that culminated in the formation of “St. Johnland,” a utopian industrial community on nearby Long Island. College Point remained a primarily rural town until the mid-1850s, when Conrad Poppenhusen (1818-1883) arrived in the region and spurred a rapid industrialization of the area. A German immigrant, Poppenhusen had already acquired a monopoly over hard-rubber items from Goodyear and opened a successful rubber factory in Williamsburg, Brooklyn before opening a factory in College Point in 1854. The need for skilled workers attracted many immigrants to the area and spearheaded the rapid development of College Point. In an age of innumerable labor abuses, Poppenhusen felt a sense of paternalism towards his workers and was instrumental in the creation of water systems, schools, and police and fire departments. During the Civil War (1861-1865), he created the Poppenhusen Institute. This provided classes in both English language and in factory skills. Construction of College Point Park began in 1988 on the former site of P.S. 27, a school destroyed by fire in 1977. The land remained vacant until Parks acquired it in 1988. 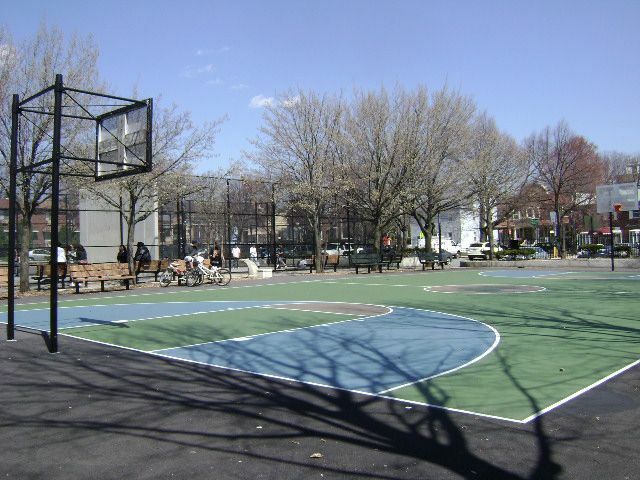 At a construction cost of $683,921, the park opened in fall 1988 with regulation-size basketball and handball courts, practice courts, and a sitting area with game tables. 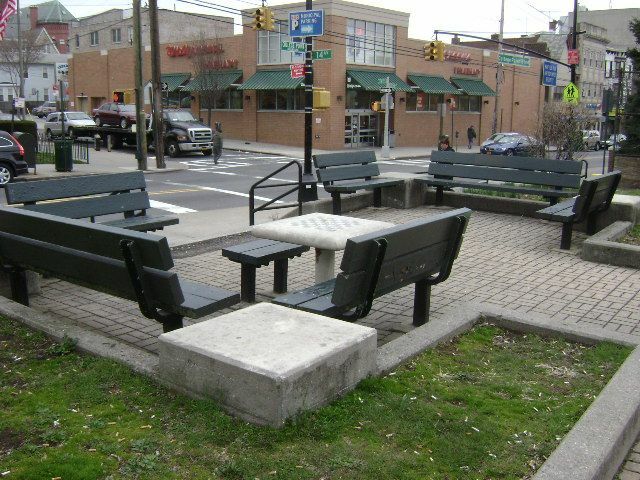 In 1997, Council Member Michael J. Abel allocated $15,716 for renovations. 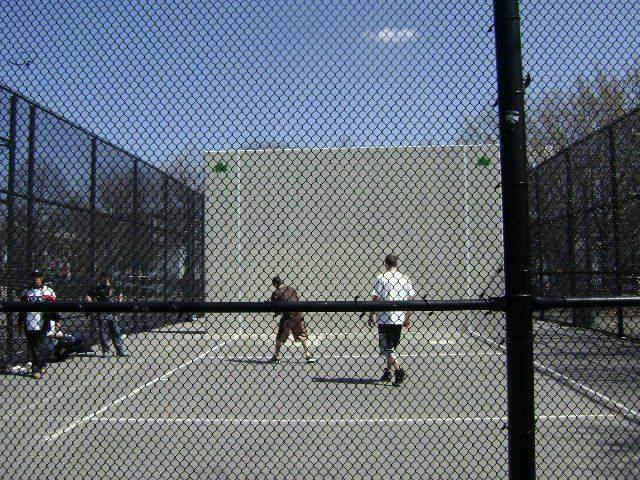 Chain-link fences, guardrails, and steel fences were added to the parkland. The park is landscaped with little leaf linden trees (Tilia cordata), northern red oaks (Quercus rubra), calleryn pears (Pyrus calleryana), and red maples (Acer rubrum).